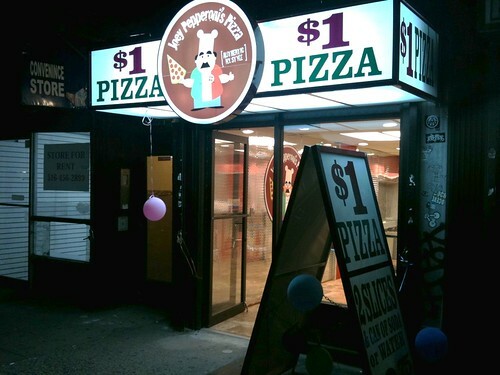 As you can see above, Joey Pepperoni’s Pizza has opened at 222 First Avenue, between 13th and 14th Streets. Curbed presents four alternatives to the SPURA plan that got the City Planning Commission’s stamp of approval this week. One proposal envisions ski slopes above big-box retailers. What does it look like when “the performative punk troupe known as Juggernut stop[s] by old-school club the Pyramid in the East Village, with their chaotic musings on topics from sciatica to bedbugs”? Paper has the answer. Serious Eats reports that Robert Paris, “a soft-spoken, cerebral, 58-year-old Umbrian who for eleven years (1997 to 2009) was the wine director and general manager at Il Buco,” is coming back to the restaurant as GM. “People come back to Il Buco for 18 years because there’s something inside that’s visceral. Roberto provides that visceral element,” says owner Donna Lennard. Grub Street notes a budding oyster trend on the Lower East Side.